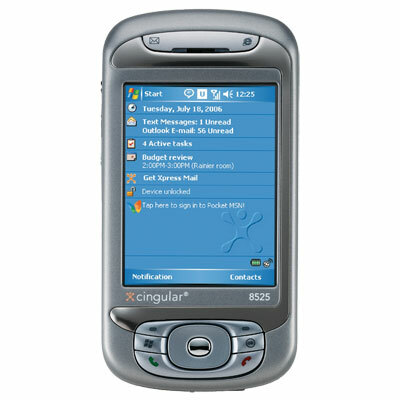 Cingular today announced the release of the 8525 smartphone and the reviews are already here. Laptop Magazine got its filthy hands on it and gave it a good rub down. The overall impression the mag walks away with is a good one. For starters, the 8525 is the first device in the U.S. to feature HSDPA wireless broadband and the first 3G device in the U.S. to have international 3G capabilities. What this means is that high rollers and other people travel around the world frequently will find the 8525 particiularly useful. 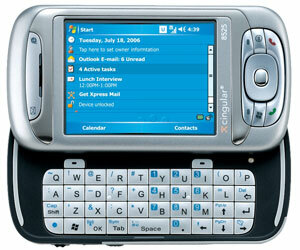 Other highlights include built-in Wi-Fi, and BlackBerry-like scroll wheel on the side and 2-megapixel camera. More insight after el jumpo. For all its pluses, the 8525 does have some rough spots, the review found. For starters, the number of places where you can actually use the HSDPA broadband capabilities in the U.S. is somewhat small, right now at 120 markets. (For comparison, Sprint and Verizon, which both use EV-DO, have 220 and 212, respectively.) The inclusion of Wi-Fi sort of nullifies that, but if HSDPA is your big selling point, it better damn well be supported in my house in Nowhereville, U. S. and A. Pusk-to-talk isn't supported yet, even though the button is there; expect to see that supported sometime in 2007. So by the looks of it, the 8525 is a good get. It combines the barely-even-deployed HSPDA standard with the familiar Windows Mobile environment quite well. It is a little on the expensive side, carrying a $400 price tag, and that's with a two-year contract. Could it top the Dash as the premier Windows Mobile smartphone? Giz reports, you decide.